Two of the houses on Oct. 29 with a sign offering the property for sale for one dollar to a buyer who moves them. 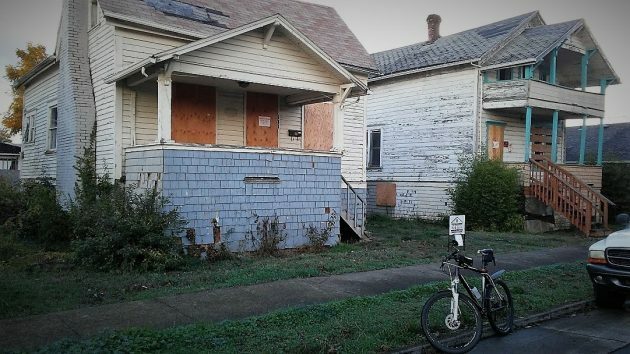 Pretty much at the last minute, an appeal has been filed against the Albany City Council’s decision to allow the demolition of three dilapidated old houses in the Monteith Historic District. The council voted 4-2 on Oct. 10 to allow homebuilders Mark and Tina Siegner to raze the three structures on one tax lot on the northeast corner of Fourth Avenue and Calapooia Street, but not for 90 days. 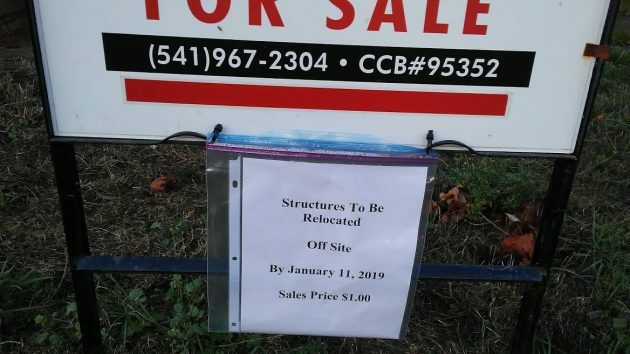 The Siegners have put up signs offering to sell the structures for a dollar to anyone who can remove them by Jan. 11, 2019, the earliest date for the demolition under the council’s action. The deadline for appealing the council’s decision to the Land Use Board of Appeals was Nov. 1. At LUBA’s office in Salem, the person who answered the phone on Friday (Nov. 2) said the appeal had just come in, by certified mail dated Oct. 31. The paperwork was filed by Carrie Richter, an attorney with the Portland law firm Bateman Seidel, which specializes in land use cases. It was filed on behalf of Bernadette Niederer, one of the people who testified against the Siegners’ demolition request at the Oct. 10 council hearing. Her online profile identifies Bernadette Niederer as a professional consultant on historic preservation and the vice president of the Monteith Historical Society. LUBA says the city of Albany now has 21 days to assemble and submit a record of the case. Niederer then has 21 days to file a brief, followed by 21 days for Albany to file a response. After that, barring some other resolution before then, the case will be set for oral argument in Salem. The Signs of Victory Mission had been using the three structures to house otherwise homeless people when the city of Albany last year evicted the residents and boarded up the places, posting them as “dangerous buildings” unfit to be occupied. The Siegners bought the property this past February for $85,000. They hoped to either renovate them or replace them with new housing. Mark and his father mucked out the houses of accumulated debris. Then they determined that restoring the structures as potential rentals would cost far too much, so they applied for permission to demolish. The Albany Landmarks Advisory Commission rejected the request, in effect staying the demolition by a year. Then the council took the case and voted that the demolition could take place after three months. At least one councilor said the waiting period was to allow for a chance to save at least one of the buildings, said to date from 1858, perhaps by moving it off the site. A local mission picked up 3 houses to shelter homeless. A local builder buys the property for $85k, figuring to rehab or replace and make a profit. Builder cleans up property and decides buildings are too far gone to rehab at a profit. Asks CARA (financer of last resort) about their interest and is rebuffed. Local advisory group is incensed at the pricing. Seems they want a museum-quality restoration, but really don’t care if the builder makes a profit. Builder asks permission to demo and is refused. City Council grants permission with a wait period to allow interested parties to buy. Nobody steps forward, but folks with no money in the game file an action to prevent the builder from demo. So, a capitalist is prevented from profiting from a prudent investment by people with no financial risk, but a fat rulebook being waved like a bible. When did little old Albany turn Communist? “When did little old Albany turn communist? Wow, how Trump-like to blow things out of proportion and damn the community in the process. In choosing these properties they VOLUNTARILY subjected themselves to the processes prescribed in law. An appeal filed is not final until the appeal is heard and decided upon. The purpose of the process is to make sure laws are followed, and it is done in the open where any interested person can follow along. Processes are used to defuse conflict in an open society. Ignoring processes removes power from the public and confers it to the hands of a few. Clearly, these days conservatives are all for dictatorial rule regardless of the law, as long as it supports their point of view. Now it seems at least one centrist does too. Now that LUBA is involved, this case will drag on for an eternity. The Preservationistas will “win” and the 3 decrepit structures will melt back into the soil before any decision is reached. A sad day for Albany, indeed. No particular historic value to those houses. Siegner’s could build new modern homes with period exterior architecture that would have far more appeal than those old houses. Make the people demanding preservation, pay for it and all legal costs. Is such dictatorial and sneaky action by government and activists a product of the left? True or false, the result is more support for the crazy right. Millions of examples somehow resembling this is what got Trump elected. So how’s that “crazy left” North Korea behaving lately? Why don’t you liberals get a life. Haven’t noticed rockets going off or nukes being detonated like we saw during the Obama years. What does Trump have to do with a land use dispute? Because the appeal is ridiculous doesn’t have anything to do with Trump. I’m sorry, my question was unclear. It was not intended ironically, but as an honest question. Is preservationism of the type described here a liberal thing? I suspect it is, but I don’t really know. What I meant is that actions like this inevitably add to the backlash that hurts the liberal cause, hence the Trump connection. Liberals need to choose their battles more wisely. Interesting that everything has to be labeled politically. Preservation has traditionally been very non-political with members from both parties supporting the retention of our cultural history. Good point. I jumped left because I grew up in the era of the evil RED MENACE. I don’t remember many successful rightwing efforts that went far. One could say that extreme right and left have each other’s backs and have an open field on the majority. Hitler & Stalin were pretty much political opposites, but the net result is similar. Stalin just left more bodies at a lower cost/murder. Hiltler got more PR. Birds of a feather and of course the totalitarian outcome is the same.. WRONG!!! And YOU should know better. Nazis were a FAR-RIGHT party, they just used “Socialist” in their name because it would sway people easier and it was in vogue in the 1930’s. Hitler used an existing group for other ends.